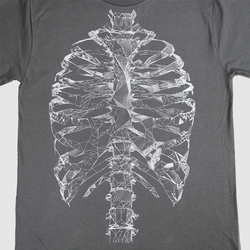 Bleep X Weirdcore - Bleep X Weirdcore T Shirt. Bleep. London based designer Weirdcore has been responsible for mind altering work for the likes of Ford & Lopatin, M.I.A, Tame Impala, Radiohead, Georgia and Aphex Twin amongst others. 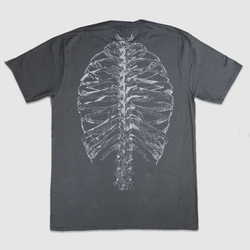 Here as part of an ongoing series he is undertaking focussing on the internal organs we have an exclusive take on the skeletal structure in his ultra stylised fashion printed on a charcoal grey tee.